Kurt Cobain was the dour, brilliant leader of Nirvana, the multiplatinum grunge band that defined the sound of the 1990s. Last week he killed himself. The last weeks of Kurt Cobain's life were filled with turmoil and anguish  and gossip. Rumors floated through the music industry that the singer- songwriter's band, Nirvana, was breaking up; that Cobain, who had survived a tranquilizer-induced coma just six weeks earlier, had suffered another overdose. The stories seemed to be justified when the group unexpectedly backed out of headlining the Lollapalooza tour this summer. The truth, it turns out, was that Cobain, who claimed to have overcome an addiction to heroin, was indeed abusing unspecified drugs. A record-industry source told TIME that two weeks ago Cobain's wife Courtney Love, front woman for the group Hole, gathered doctors and friends together in Seattle, the couple's home, to try to scare Cobain into dealing with his problem; Nirvana's managers even threatened to drop Cobain from their roster unless he got cleaned up. The intervention seemed to work, for Cobain checked into a California treatment center. But according to a missing-persons report filed by his mother, he fled early last week. Seattle police periodically checked Cobain's house, finding no traces of the singer. Last Friday, an electrician visited the house to install a security system. When no one answered the front door, he walked around the house, peering through windows. He thought he saw a mannequin sprawled on the floor, until he noticed a splotch of blood by its ear. 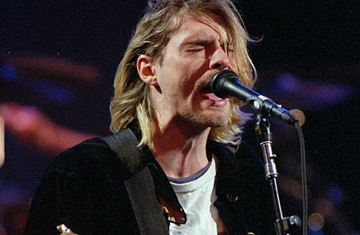 When police and the coroner broke down the door, they found Cobain dead on the floor, a shotgun still pointed at his chin and, on a nearby counter, a suicide note penned in red ink, reportedly ending with the words "I love you, I love you," addressed, a source said, to Love and the couple's 19-month-old daughter Frances Bean. Kurt Cobain, dead at 27. The news came as a shock to millions of rock fans, and MTV pre-empted its usual programming for hours of J.F.K.-like mourning, with a somber Kurt Loder playing the Walter Cronkite role. Given Cobain's talent and influence, however, the reaction was understandable. Nirvana came from the music-industry equivalent of nowhere, with a rough-edged first album recorded for a chiselly $606. The next, Nevermind, released 2 1/2 years ago, contained a series of crunching, screaming songs that also had catchy melodies, part punk, part Beatles. Selling almost 10 million copies and knocking Michael Jackson's Dangerous from the top of the charts, the album fibrillated the psyche of a generation. It also launched the commercial vogue for grunge and made Seattle famous for something other than cappuccino, rain and bad professional sports. Before long, equally abrasive Seattle groups like Pearl Jam (a Nirvana rival), Mudhoney and Alice in Chains joined Nirvana high on the charts. The New Liverpool, Rolling Stone called the city in early 1992 (launching searches for the New Seattle). Cobain was at the center of it all, the John Lennon of the swinging Northwest, a songwriter with a gift for searing lyrics as well as seductive hooks, a performer with a play of facial expressions so edgy and complicated that they rivaled Jack Nicholson's. See the all TIME 100 albums.